Line 3 cookie sheets with cooking parchment paper or silicone nonstick baking mats. Place each sugar in separate small bowl; set aside. Cut cookie dough into 21 slices. Cut each slice in half; roll each half into a ball. Roll 9 balls in blue sugar, completely coating dough; place on cookie sheets. Roll half of remaining balls in red sugar; place on cookie sheets. Roll remaining balls in granulated sugar; place on cookie sheets. Refrigerate at least 15 minutes. Meanwhile, heat oven to 350°F. Once balls are chilled, bake 7 to 8 minutes or until cookies no longer have a glossy sheen. Remove from cookie sheets to cooling racks; cool completely, about 15 minutes. On serving tray, arrange blue cookies to look like blue on American flag. Arrange rows of red and white cookies to complete appearance for a total of 5 rows of 8 cookies each. Eat the remaining 2 cookies! You can find blue and red sugars at most grocery and craft stores leading up to the Fourth of July. Instead of dipping the cookies in the blue sugar, make them all red and white. 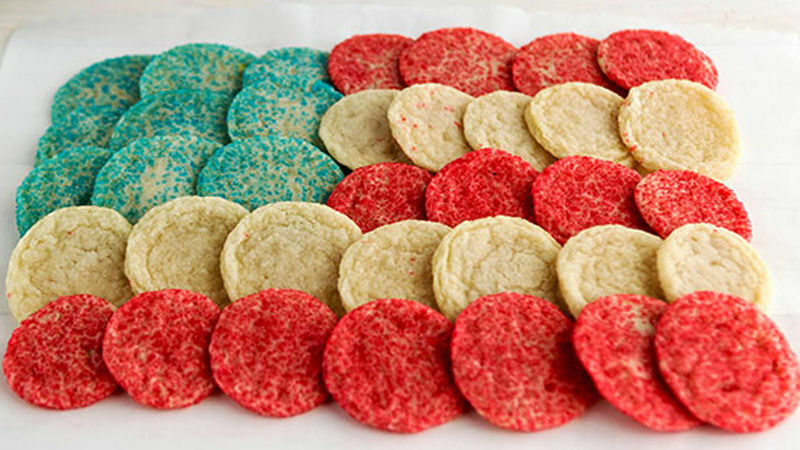 Then arrange them in the flag shape, but place a bowl full of blue-tinted whipped topping in the corner for a sweet cookie dip.